Jim Kenny is the Democratic Party candidate for mayor of Philadelphia. On Tuesday, May 19, 2015, voters in Philadelphia sent a message to billionaire venture philanthropists who were trying to buy the office of mayor of Philadelphia to promote their privatization of public schools agenda. By the day of the primary elecction for mayor and other offices they had invested $7 million in advertising for the candidate they thought would carry out their agenda, State Senator Anthony Williams. 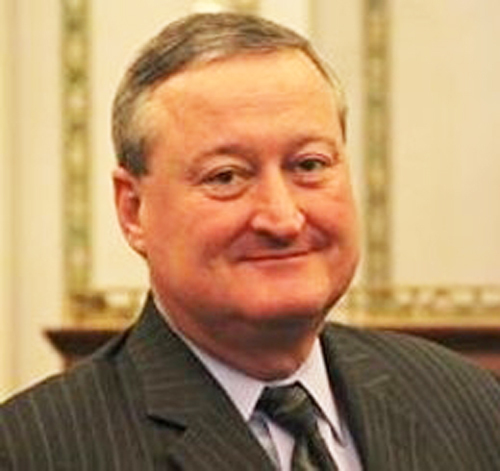 Former Councilman Jim Kenney defeated Williams by a 2-to-1 margin winning a plurality in all wards in the city. Kenney ran on a progressive platform, including the ending �stop and frisk� by police, raising the minimum wage to $15 an hour, and establishing universal pre-Kindergarten. Even before he decided to run for mayor, Kennedy was praised for championing the erecting of a statute in City Hall for forgotten civil rights pioneer Octavius Catto. Kenney has also been a supporter of immigrant rights. At the beginning of the campaign, Anthony Williams was considered the frontrunner. As the campaign progressed, despite flooding the airwaves with campaign commercials beyond what any other candidate could do, Williams began to drop in the polls. Williams attempted to give the appearance of distancing himself from what had been his signature role in the Pennsylvania state legislature for ten years, the promotion of charters and vouchers. As it was clear his campaign was in trouble, Philadelphia Inquirer editorial page editor (the Inquirer endorsed Williams) Harold Jackson appealed to Williams to �run on his beliefs�. Williams duplicity only made voters question what he was hiding about his plans for public education. In the days before the end of the campaign Williams appealed to ethnic solidarity to get votes in the African-American community. This too backfired as Kenney won a plurality of the votes in the 30 predominantly black wards. In the days before the primary, the fractured Democratic Party coalesced around Kenney with endorsements from Mayor Nutter, City Council President Darrell Clark, and some Black clergy switching from supporting Williams to Kenney. There was speculation in the press that School Reform Commission member Bill Green will run as an independent in the November election to promote his privatization of education agenda. Green had been outspoken in his support of Williams despite being a member of the School Reform Commission since his appointment by Governor Corbett. He contributed the legal limit of $2900 to his campaign. Green said the election of Kenney �was no coronation� as evidenced by the low voter turnout. While the election is a victory for democracy over the attempt of wealthy hedge fund managers to buy an election, we can have no illusions that public education in Philadelphia is now safe. Quite the opposite! On May 13th, the SRC announced that they want to outsource public school nurses to private companies.Listen to this interview with school nurse Eileen Duffey talking about what this will mean for medical services in Philadelphia public schools. On May 17th, the School District announced a contract had been reached with the union of the lowest paid employees in the District, noontime aides and cafeteria workers. While these low paid workers received a modest wage increase, it came at the cost of the District stopping payments into the union�s health and welfare fund and the lose of seniority protections for layoffs and rehires. Superintendent William Hite, a graduate of the Broad Superintendents Academy, took the opportunity to lecture to lecture the Philadelphia Federation of Teachers to follow this example of �shared sacrifice� to make up for the underfunding of the public schools. The SRC has announced their first �turnaround of a turnaround�, (a term invented so they didn't have to have community meetings) the turning over of a �failed� independent charter school to charter management company Mastery. Early in the campaign he was for expansion of charters as long as the state reimburses their cost. Late in the campaign he ended his commercials with �I support all public schools in Philadelphia�. The qualifier �all� indicates he thinks, despite their classification by the U. S. Census Bureau, that charter schools are public schools. This raises concerns of how much resistance he will make to ALEC legislators in Harrisburg who want to expand charters. The Pennsylvania School Boards Association has recently questioned why the Pennsylvania Coalition of Public Charter Schools is advising its members not to follow Pennsylvania Right-to-Know which traditional public schools must follow by law. In the past Kenney has supported vouchers. One of Kenney�s early backers, Senator Dwight Evans, not only is a strong proponent of charters, but for more than ten years he has been a proponent of vouchers, which are presently in the form of Educational Improvement Tax Credits, a back-door voucher program. The EITC diverts business tax money for public schools to student scholarships for private and religious schools of the business�s choosing. The EITC and the Opportunity Scholarship Tax Credit program pose a grave, and largely unrecognized, danger to public education. In addition, this legislation is a clear violation of separation of church and state. Weingarten gave her usual stump speech with much fist pumping and effusive praise for Helen Gym as the Superwoman we have been waiting for. As usual, it was much �sound and fury signifying nothing.� There is no way that one Councilwoman, no matter how gifted, can stop the privatization onslaught. While a seat in City Council will give Helen Gym a powerful platform to fight for public schools, it will be within a Democratic Party which places priority on the interests of real estate developers, corporate interests such as Comcast, theChamber of Commerce, and the banking community, not the common good. Philadelphia Federation of Teachers President Jerry Jordan has not proposed any trade union fight against the attacks. His response to both the privatization of substitute teaching and nursing is that the PFT would be "pursuing every option available to stop the privatization of our public schools." This is his weak-kneed response to the balkanization of the Philadelphia School District despite his acknowledgement that privatizationhas been prepared by the Boston Consulting Group for several years. For details see �Who is killing Philly schools?� 5/2/12 and �Who�s Still Killing Philly Schools?� 5/22/2013 by Daniel Denvir in the Philadelphia City Paper. Immediately after the rally, Ms. Weingarten rushed off to New York City where she joined Wendy Kopp, founder of Teach for America, officials from the Gates Foundation and other educational technology enthusiastsat the Oppi Learning Festival 2015. The program says �Oppi Festival is a unique learning event which allows all education key stakeholder groups from around the world to come together, share ideas and experiences, tackle challenges and form new partnerships. Weingarten returned to Philadelphia Tuesday to campaign for Kenney and Gym and to join the victory celebration at Helen Gym�s campaign headquarters. As is the case many times in history, young people who have their whole lives in front of them and want a say in what kind of world they will live in, are unencombered by past practices and political connections. On May 12th, hundreds of Philadelphia High School students walked out of school and Opted Out at the beginning of the Pennsylvania Keystone standardized tests. Some administrators threated the students with being denied the right to participate in the Prom or walk in their graduation. A Philadelphia teacher shares what it�s like to subject students to hours of standardized testing and what it is doing to his students.